Get organized: It's a New Year's resolution we seem to make year after year, BUT as life gets busy, it's easy to let clutter take over again, unless you manage it the right way. 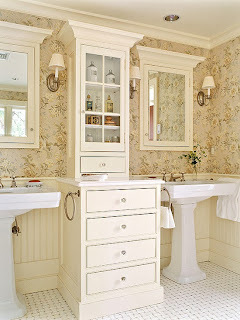 Get our advice, tips, and tricks to make 2014 the year you get organized once and for all.....In The Bathroom! 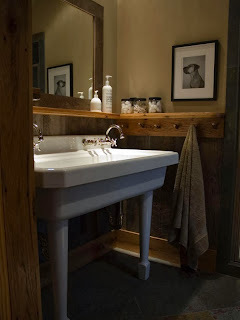 Make It Work ~ A custom cabinet between two pedestal sinks means you can have the style of a pedestal along with the function of a vanity. A shallow upper cabinet offers counter space. Recessed medicine cabinets above the sinks supplement storage. 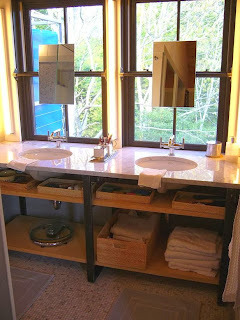 In the Basket ~ Cut clutter in a bathroom cabinet with baskets. Put like items in each one to stay organized. Use matching baskets for a cohesive look. 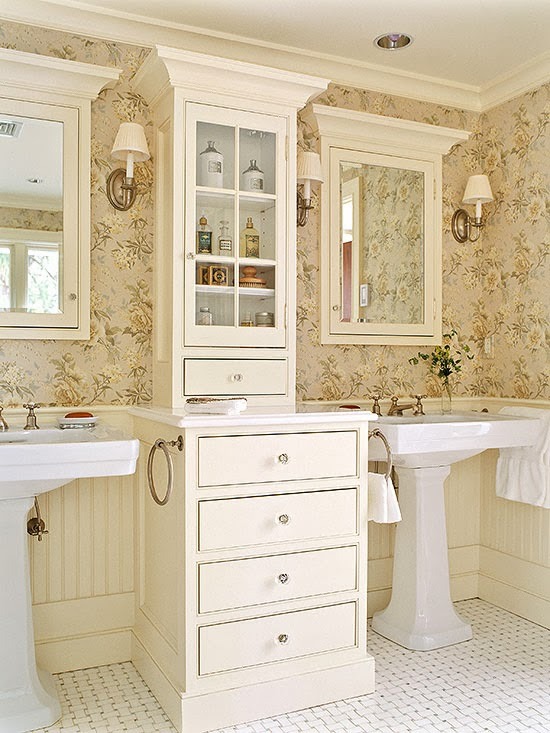 Countertop Solutions ~ A double vanity gets a storage boost with a countertop cabinet. Keep clutter at bay and store toothbrushes, styling products, and other grooming accessories in drawers and cabinets. 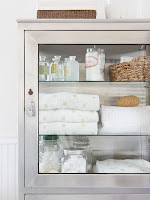 A divider in the open lower shelf keeps towels organized. 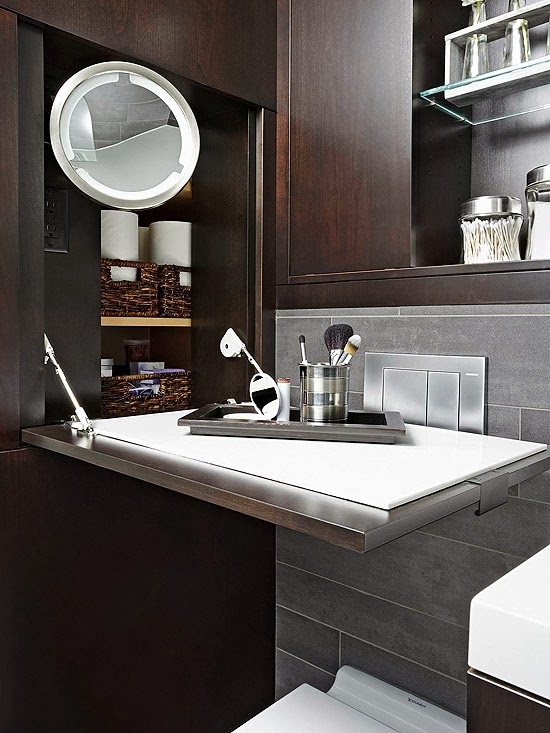 The unit also makes use of vertical space between the sinks of a double vanity and provides easy-to-reach storage for both sink areas. 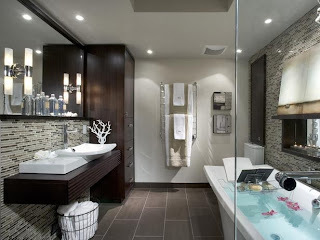 For extra savvy functionality, include an outlet in the cabinet for razors, hair dryers, and more. 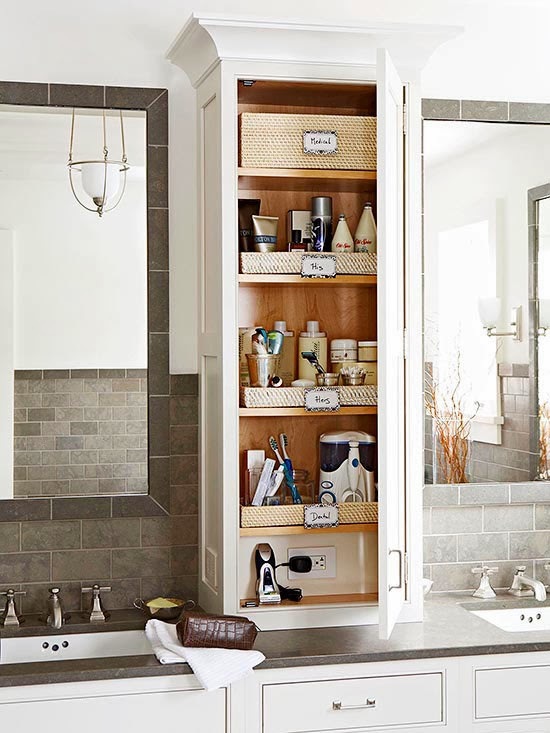 Storage Options ~ This master bathroom, designed by Candice Olson, features several varieties of storage options. There's a basket for linens underneath the sink, a clever shelf in front of the mirror, a floor-to-ceiling armoire and on-the-wall towel racks. 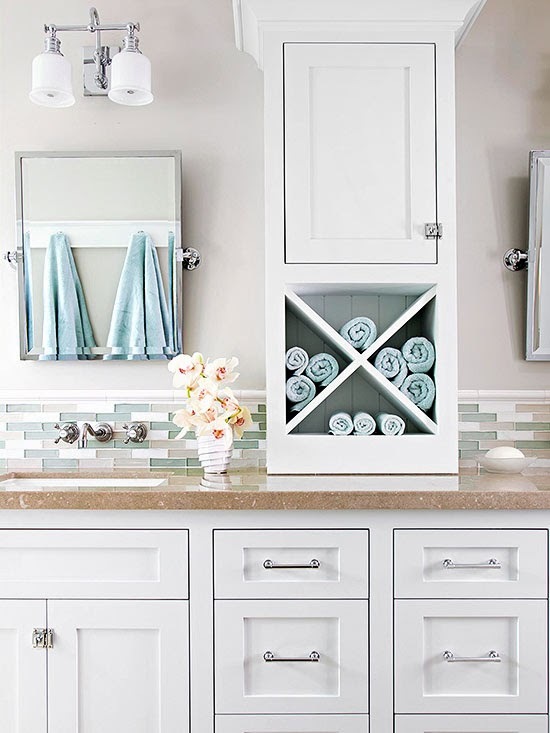 Just Shelve It ~ The slender shelves surrounding the sink in this bathroom provide ample storage space both on top as well as with pegs underneath. 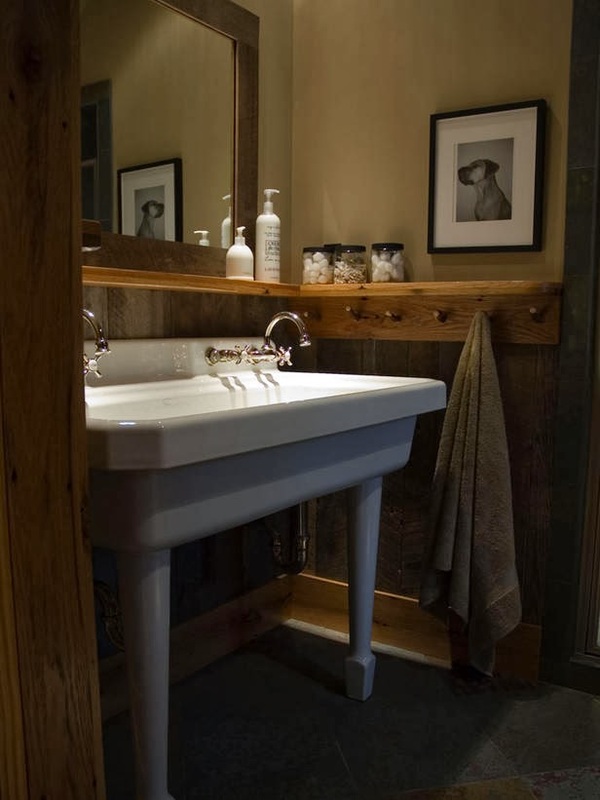 An added bonus is the oversized sink, which can be used by multiple people if need be. Vertical Storage, Take Two ~ For smaller vanities, employ the same vertical storage principal, but execute it on a stretch of wall instead. 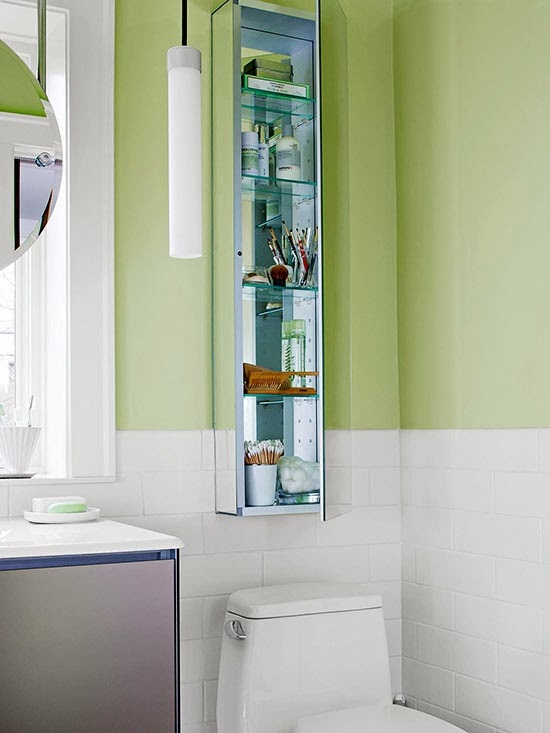 Here, a tall wall-mount shelving unit above the toilet adds much needed storage to the petite space. 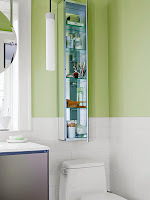 A mirrored door on the cabinet conceals storage and prevents items from tumbling into the toilet. 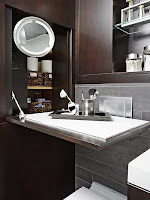 Clever and Compact ~ For bathrooms that are a tight squeeze, consider a flip-down shelf with hidden storage behind it. 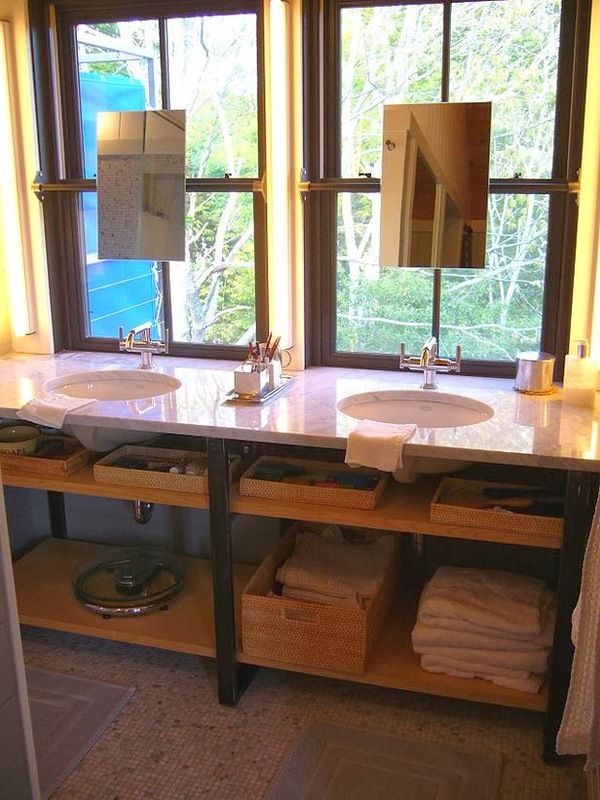 The shelf in this tiny bathroom folds out from the wall to be within reach of the vanity. In the wall niche, a makeup mirror turns the shelf into a full-fledged vanity, creating a bathroom that can now accommodate two. As a bonus, the shelf is topped with quartz, a heat-resistant and easy-to-clean surface. Under the Sink doesn't mean Understated ~ Under-sink storage doesn't always have to be behind closed doors. Expose how stylish your storage is with cute wicker baskets in various sizes. 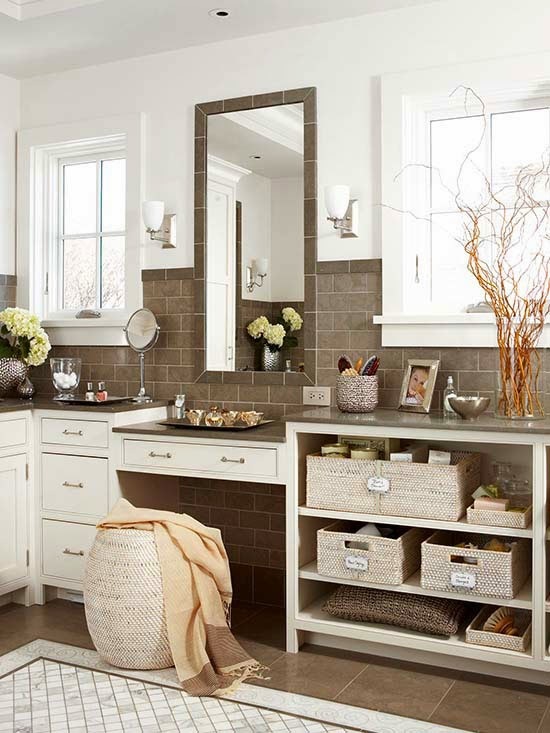 Double Duty ~ Add a bench in a bath for extra storage. A cushion covered with terry cloth offers a convenient place to dry off. 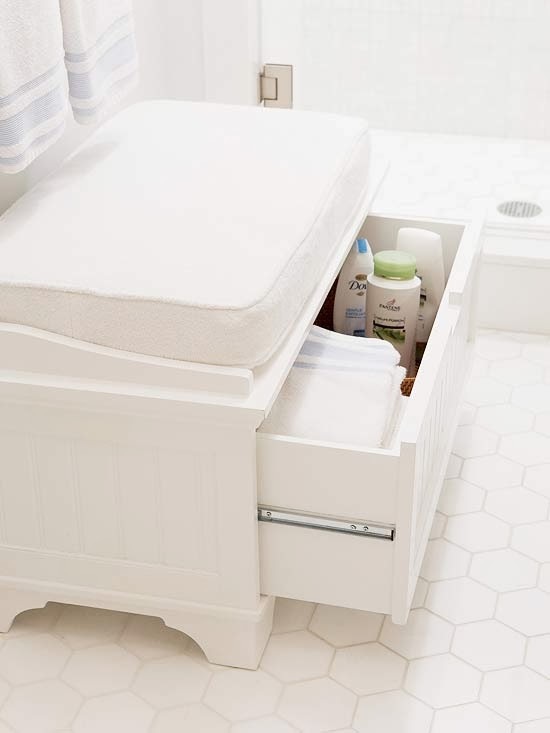 The built-in drawer holds extra towels and toiletries. 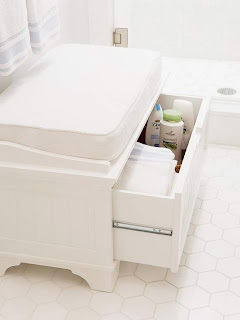 Enlist New Storage ~ If your bath lacks a closet, repurpose a cabinet or dresser to keep extra linens and supplies on hand. Bath oils and bulk items, such as cotton swabs, look pretty in glass jars -- plus it's easy to know when to restock.